Mr. Chaney Woodring, Sam Dan and his students have joined and teamed up with the Independent Tang Soo Do Association. Mr. Woodring is the head instructor at the Traditional Tang Soo Do Academy located at 736 Lincoln Street, Bolivar, PA 15923. The Traditional Tang Soo Do classes offers classes for both children and adults. Mr. Woodring is a 3rd Dan in Tang Soo Do and his experience spans over 30 years, having started in Shotokan Karate-do in 1977. Mr. Woodring and his students were accepted by Master Garbowsky as members of the Independent Tang Soo Do Association in April 2013. 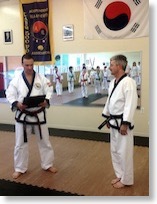 Master Garbowsky presented Mr. Woodring with an Official Association Acceptance Letter, accepting him and his students into the Independent Tang Soo Do Association on Monday, April 22nd, 2013. As Founder of the Independent Tang Soo Do Association and head instructor of South Hills Karate Academy, I am happy to announce the results of the 5th Dan Classing Examination that took place on March 14th and 16th , 2013. The Independent Tang Soo Do Association's Dan Classing Examination is an event that I am particularly proud of and I am sure that all who participated in this year's Spring event are as well. The Association's Dan Testing and Recertification is an extensive two day process where our Yu Dan Ja (Black Belt holders) and candidates get together over two days. We train together, learn new material, fight against each other and drill in techniques over four to five hours on day one. On day two, over another 5 hour period, we have our Yu Dan Ja and Candidates present their requirements and demonstrate required technique, hyung, sparring and breaking. The process for Kyo Sa also includes submitting two written essays on rank specific material. Promotions will be awarded at the start of the 36th Gup Shim Sa on Saturday, May 4th at 9:00am. Please join us for this promotion ceremony. Please join me congratulating the following students who were tested and promoted during the 35th Shim Sa. Promotions will begin to be given out beginning on Wednesday, April 10th beginning at the 6:00PM Children’s Class and continue at all classes following. The official announcement can be found here and is posted at the school. Mr. Weir will be giving out promotions at the Elizabeth location at his classes on or after April 10th. Please let me know any questions that you may have.